Hi friends!! Happy Sunday! I don't know how the weather is where you are, but here it is cold and snowy..perfect weather for scrapping the day away, and I have just the thing to inspire you! The newest sketch from Creative Scrappers! I changed it up a bit and used just one larger photo instead of the three small...when I saw the sketch, I instantly thought of this photo, so I had to figure out how to make it work (I already had it printed lol) I used the fun Notable collection from We R Memory Keepers, which I am so in love with! The colors are fabulous! Simply upload your layout based on this sketch or sketch #261 by February 28th! Have a great day, and take time to create something you love! I love this! Where did you get the chevron background - it's great! So cute Amanda!! 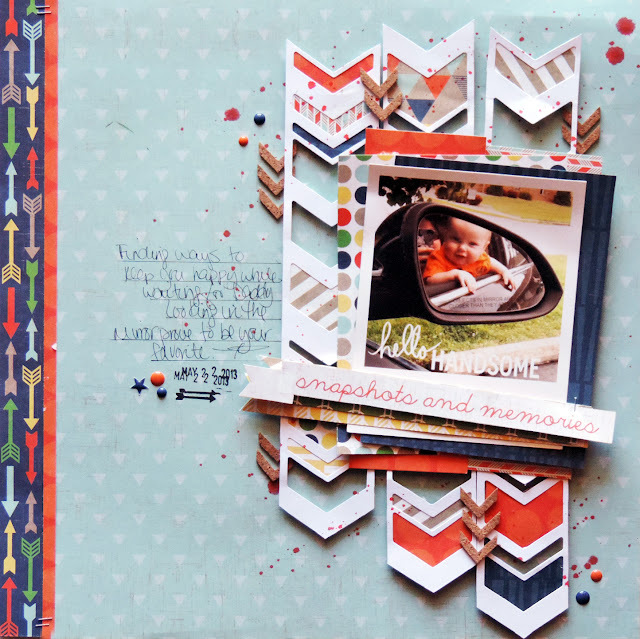 Love how you layered the chevron pieces behind your cute photo!! Love Love Love this Amanda! Just love the negative chevrons and the color combo is fab. LOVE this sketch and your LO! Awesome!